CSRF and UI Redressing (Click/Tab/Event Jacking) attack vectors are popular ways to abuse cross domain HTTP calls and events. 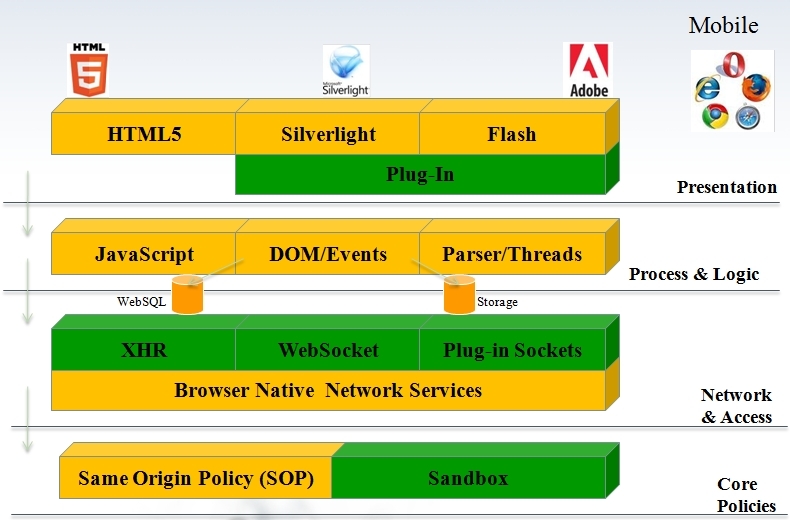 HTML5, Web 2.0 and RIA (Flash/Silverlight) applications are loaded in browser with native state or using plug-ins. DOM used to be an integral part of the browser and now it is becoming even more important aspect with reference to web applications. Web applications are using DOM in very complex and effective way to serve their client better and leveraging all possible features allowed by DOM specifications. 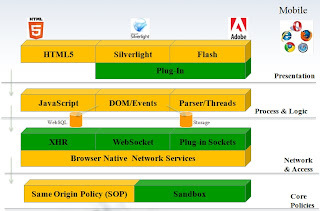 There are many applications run as single DOM app and once it gets loaded, it remains in scope across the application life cycle. CORS and SOP have to play critical role in protecting Cross Origin Resources and control relevant HTTP calls. HTML5 and RIA applications are having various different resources like Flash files, Silverligh, video, audio etc. These resources are loaded in their own little object space which is defined by specific tag. These resources are accessible by DOM and can be manipulated as well. If DOM is forced to change underlying resource on the fly and replaced by cross origin/domain resource then it causes Cross Origin Resource Jacking (CROJacking). Let’s assume there are two domains – foobank.com and evil.com. Foobank application is having flash driven application and it has its own login swf (login.swf) file. This flash component is loaded via object in the browser. If by DOM call this login.swf file is replaced by similar file residing on evil.com then it will cause CORJacking and user would be under impression that he/she is using foobank.com resources. Also, reverse would be possible as well. Evil.com loads resources residing on Foobank.com domain and it will cause reverse CORJacking. Here is a small DEMO of CORJacking with Flash resource. HTML page is loaded in the browser and this object which is coming from foobank.com domain is being loaded. Assuming this page has DOM based issue and possible to inject/manipulate this value. Hence, if we want to access src of this object tag then through DOM we get its access. Interestingly document.getElementsByName(‘Login’).item(0).src is not just read only value, one can assign a cross origin resource to it on the fly. Hence, below line will actually change the resource and loads login.swf file from evil.com domain. This will clearly hijack the resource and user will be under impression that it is negotiating with foobank’s login component but actual component is from evil domain. This is the case of CORJacking and reverse can be done as well. Evil domain can load Foobank component and causes reverse CORJacking. Emerging as popular standard to create Rich Internet Applications and competing with technology stacks like Adobe’s Flex/Flash and Microsoft’s Silverlight is HTML5. HTML5 brings several new features and functionalities that allow developers to create really attractive and robust applications. These applications can run on any browser and platform, although with some limitations. HTML5 applications are also supported by mobile devices. Hence, you can create your application once and run it on several devices and browsers. Each time, every new technology stack throws up new security challenges and vulnerabilities. HTML 5, though very promising, is no different. There are security concerns that need to be addressed when creating applications. Let us look at the top 10 possible attack vectors associated with HTML5 and modern browser architecture. Next Generation Web Attacks - HTML 5, DOM (L3) and XHR (L2) with Shreeraj Shah, Blueinfy Solutions Pvt. Ltd. from OWASP on Vimeo. DOM based XSS are becoming relatively common with Web 2.0 and Ajax driven applications. DOM based applications are using eval() method to inject new stream into the existing DOM. In certain cases it is becoming tricky to pass on the values for pen-testing and to create an abuse/exploit scenario. Recently during consulting we came across different DOM based XSS and objective is to get a pop-up to confirm the vulnerability. If we get an eval call then it is possible to double eval-ing to convert text back into payload. Here is a simple scenario; it can be complicated on case to case basis. Here “koko” is coming from URL or controlled by user. Hence, if we pass on the value in following URL it gets to the “getProduct” function. Testing scenario is simple, it causes DOM based XSS with following condition. We are passing payload terminating function, ending statement and commenting out rest of the script. We get a simple pop-up if we pass on following code. But to prove a point if we want to craft any other payload where we need to send single quote, for example want to execute “document.getElementsByName('Login')” will not work since we have that single quote that will raise syntax error. For simplicity if we pass on alert(‘hi’), it will not work and we will not get popup in above scenario. We get following error in the browser. It will avoid error and we will get a pop-up. What we did was simple, we used fromCharCode function and passed on decimal values for alert(‘hi’) here, first eval will convert it into string and second eval will execute the code. Hence, double eval can rescue while testing DOM based XSS. Double eval() can be leveraged for string operations and concatenation.